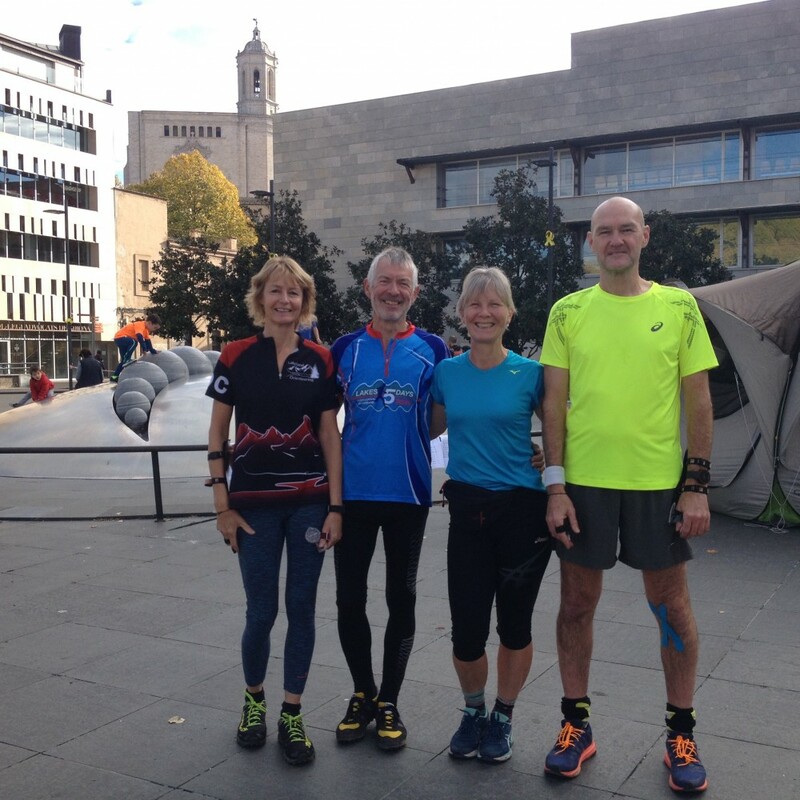 Louise and Graham and Lindsey and Dave all travelled to Girona over the weekend of 8th - 11th November for the latest events, Louise has sent the following report from the weekend. These are usually located within easy travel distance of a major airport and are accessible by public transport. This means that they are ideal for a short break and provide an opportunity for a spot of sightseeing with some orienteering races. If you are lucky you can squeeze in three races. 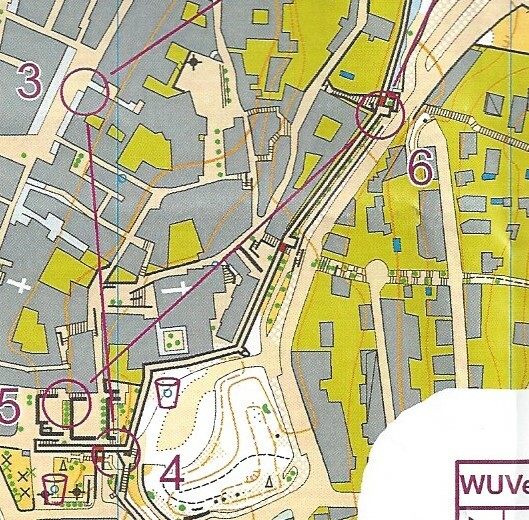 A night sprint race on the Friday, a middle distance race (usually in wooded terrain) on the Saturday and the main long distance city race on the Sunday morning. The events scheduled for the Autumn are usually in countries with a milder climate, and if you’re lucky in places where you can catch some late summer sunshine. There are always a small band of competitors from the UK but usually Graham and I are the only LOC contingent. However this year we were joined in Girona by Lindsey and Dave who are currently travelling around France and Spain in their newly acquired camper van. Although there were regular flights to Barcelona it would have been a bit tight to make the night race if we had travelled out on Friday so we opted for to stay an extra night. This allowed for a leisurely day sightseeing in Girona on the Friday which proved to be beneficial for making route choices in the city race. 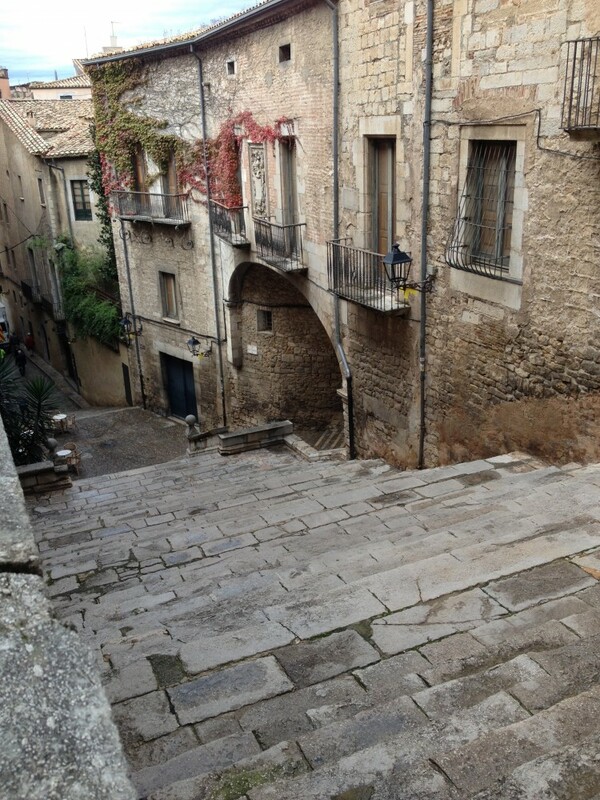 Girona’s old town and Jewish quarter are beautiful and are surrounded by well maintained city walls. Dominating the city is the cathedral with its imposing entrance and adjacent buildings, most of which were festooned in Catalan flags. In addition to the myriad interlinking narrow streets and alleys there were hundreds of steps. Interspersed amongst the town were small plazas, enclosed gardens and paths running under the city walls to a steeply sided wooded area. This description doesn’t do credit to the complexity of the terrain and after wandering around the city for most of the day Graham and I were in agreement that it was probably one of the best venues for an urban orienteering race that we’d seen. The sprint race on the Friday was located around the remains of Montjuic Castle, a short bus journey up a hill from Girona centre. Due to my ill timed sprained ankle a couple of weeks earlier I was being selective about what I did over the weekend and opted not to risk the stony uneven ground of a night race. The verdict from those who did participate was that it was a good little area for a night event with some tricky route choices between the ruined walls. The choice of area for the middle distance event on the Saturday was a bit disappointing. Had it been an option it would have been better (as has happened at other events) for the race organisers to bus competitors a little further out from the city to a more technical rural area. As it was they used a rough wooded area on the outskirts of Girona. There was a timed out section across a residential area before the final part of the race in (to be honest) a boring section of flat open parkland. The city race on Sunday was more challenging. Take the wrong alley or climb the wrong steps and you could end up needlessly climbing or hitting an unpassable wall. Navigating to the controls located on the city walls proved to be the downfall of quite a number of competitors. Take a look at the attached extract from my map and the route choice from 5-6. As I was walking (and was doing WUV) I did have time to think and I had the benefit of the previous day’s sightseeing. I recalled that access to the walls was only possible in a few places so went south out of 5 and up the steps on to the wall. Many others chose to follow the road north-west thinking that they would be able to get onto the walls up the steps below control 6. Wrong! Those steps took you up to a level still below the walls with underpasses to the road outside. A fair assessment of the LOC members results would be… “could do better”. Nevertheless this was an enjoyable event around a fabulous city and the sun shone. What’s not to like?